You must be a member of the Mexico City Music Lovers Group to attend this activity. Would you like to join this group? This is a great opportunity for those new to Opera's as this is an Opera in just two acts and very light as is a comic Opera (Opera's are usually ending in tragedies) so those who ae unsure if you like Opera's don't miss it! Beside above the main role in this Opera (Tonio) is performed by our great worldwide known Mexican Opera singer (Tenor) Javier Camarena! and Pretty Yende in the role of Marie. World Premiere: Opéra Comique, Paris, Protected content . This frothy comedy mixes humor with a rush of buoyant melody and notorious vocal challenges. The story concerns a young orphan girl raised by an army regiment as their mascot and begins at the moment of her first stirrings of love. Complications (and comedy) ensue when her true identity is discovered. The action is startlingly simple and unencumbered by intricate subplots, allowing the full charm of the characters and their virtuosic music to come across in an uninhibited way. Remember to come with warm comfortable clothes as inside the AN will be chilly. 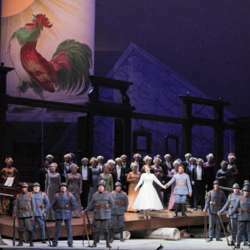 Looking forward to enjoy this great Opera live transmission from the MET!